The blog this week comes from Emily, our Project Conservator. 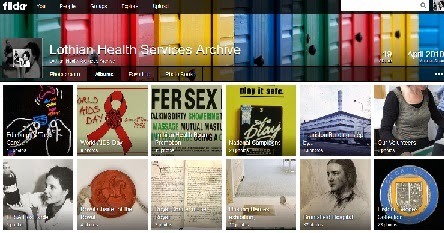 I am now halfway through a 12-month project to conserve LHSA’s HIV/AIDS collections. Since I started in January, time has really flown by and I am very proud of what I have achieved in six months. Project based positions like this are very common for new professionals such as myself. Although it can be worrying not knowing what jobs will be available in the future, or where they may be, I believe there are many positive aspects to undertaking short fixed-term contracts. Firstly, a wide range of conservation experience can be gained from working at different posts. My current post deals with modern papers and plastics, whereas my previous role was based at an 11th century castle and I worked with maps and plans from the 18th and 19th centuries. 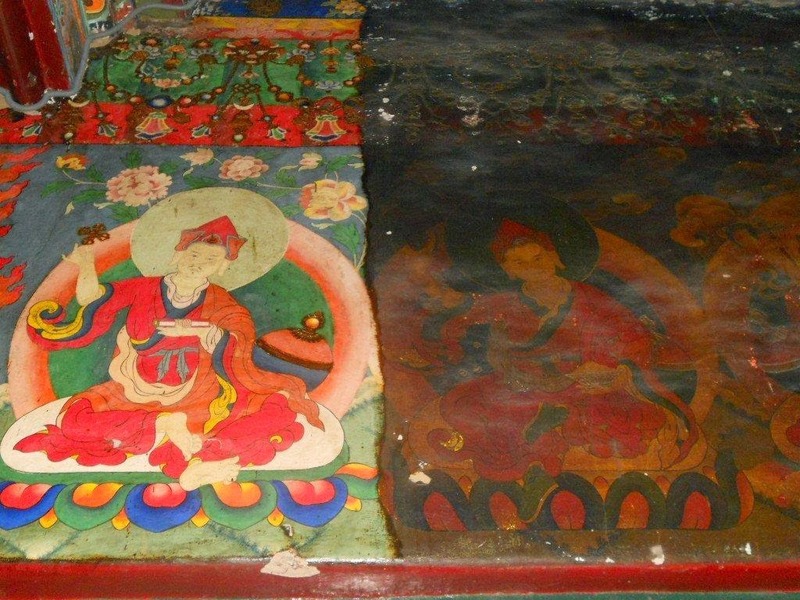 Prior to this, I lived and worked in rural India at a Buddhist monastery to conserve its wall paintings and I’ve also worked in a high-tech conservation studio in Singapore! All very different roles, but all very enjoyable! Although I did not expect to be working with condoms and balloons when I graduated from a fine art conservation degree last year, I have enjoyed working with these modern objects. I had little prior knowledge of this type of material before I started, but I’ve had the chance to study this subject further in this role. Early on in this project, I was able to undertake an online course on the conservation of plastics. This was a fantastic experience as I was able to learn a great deal about plastics and discuss conservation problems with professionals from all over the world, all from the comfort of our office! This was not only beneficial to me, but I was also able to improve the housing of our plastics objects based on the knowledge gained from this class. I have also taken advantage of other types of training available at Edinburgh University whilst in this post. The University offers many professional development classes. I was keen to take part in the ‘Presentation Skills’ course as this is something that I have always struggled with and wanted to improve. I found this day really useful and I was able to implement the advice given in presentations to tour groups and peers. Another useful class was ‘Writing for the Web’ which gave instruction on designing websites. This is something that will be really useful in the future, with more and more content being accessed online. Last week, I also attended an ‘Interview Skills’ class to prepare for the impending end of my contract! During my time here, I have tried to take advantage of any opportunities that have come my way. 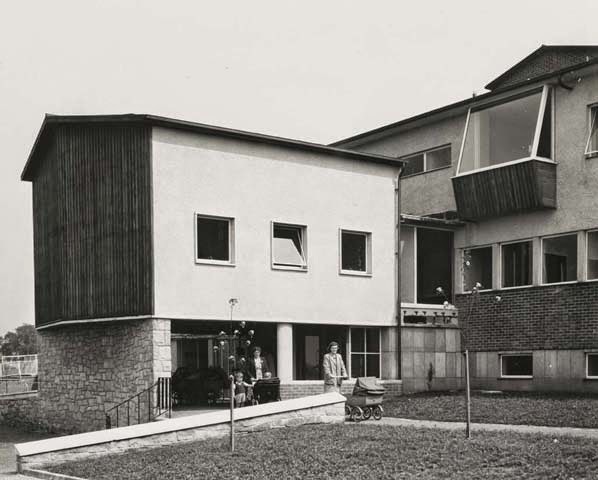 Inspired by the modern materials in the collection and supported by my line manager, Ruth, I applied to the Wellcome Trust Small Grant Fund to put on a symposium. I recently found out that I was successful in this bid and plan to hold the event, which will focus on the conservation of modern plastics and funding applications, at the end of November. On the back of this, I have also been asked to present at a conference in London on the conservation of the HIV/AIDS collection – both things I never imagined I would be doing when I started this job! I’ve also had the occasion to help put on ‘Conservation Taster Day’ and work with interns. In the near future I will also be supervising volunteers and interns in the studio. Over the next six months, I am looking forward to seeing where else this project will take me, and of course actually completing the conservation work on time! My advice to others, in similar positions to me, is to jump in with both feet to whatever project you find yourself in and make the most of the chances that are available. It is surprising where they may lead you! Although the main objective of the HIV/AIDS project is to catalogue the records and make them available for all users who have an interest in them; it is also important that we promote the collections as widely as possible otherwise users won’t know that the records exist. The use of various social media platforms means that project updates are now available to anyone in any country in the world, which has opened up new avenues of communication that would not be available to the project otherwise. 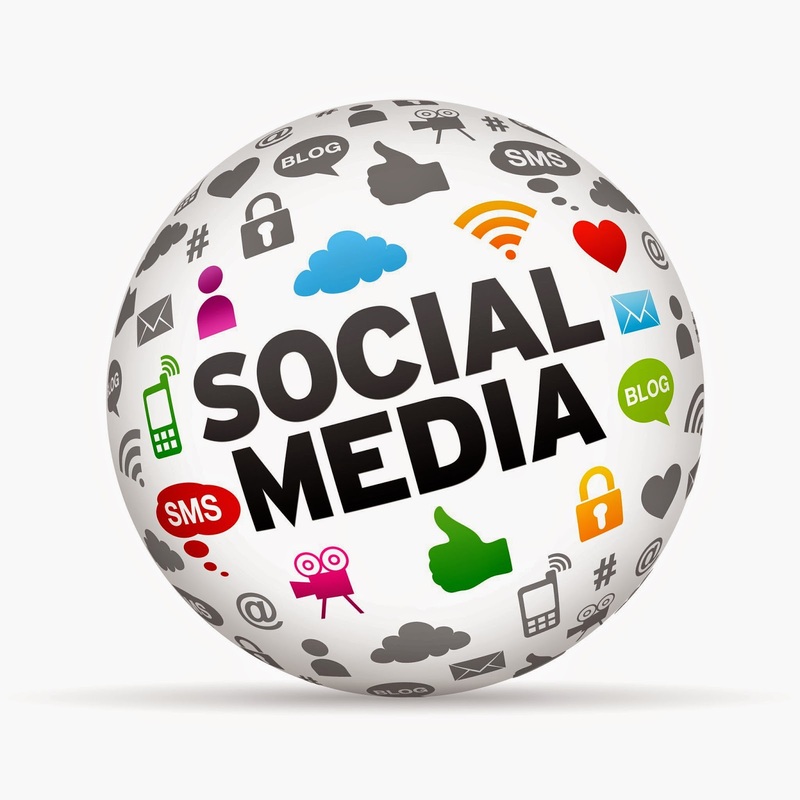 Social media revolutionised the way we connect with our users! 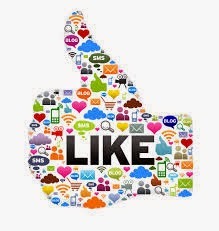 LHSA as as institution has been involved in social media communication since 2009 and currently has a Facebook page, twitter feed, Flickr gallery and this blog. Having a range of communication methods allows our users to connect with is in a way that suits them and only link to the posts and feeds that interest them. 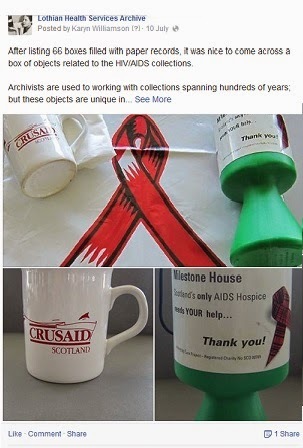 In terms of the HIV/AIDS project, the visual element of the collections means that social media is an excellent way to generate interest in the collections and the work to catalogue and preserve them. 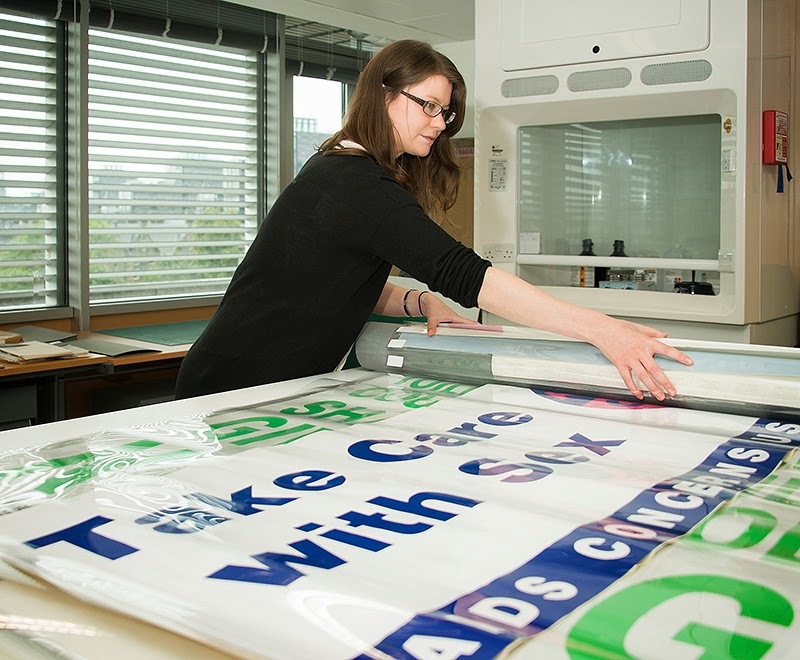 The HIV/AIDS collections involved contain a large volume of promotional postcards, information leaflets, business cards, posters and photographs. Before the invention of social media, items like these could only be displayed in exhibitions in small numbers meaning that lots of the items could go unseen by many people who may be interested in them. Uploading these images to Flickr means that anyone searching the interenet for related topics will see the images and know where to access them should they wish to in the future. Searching a catalogue on-line, making an appointment and coming in to view records on a subject of interest can be a time consuming activity. 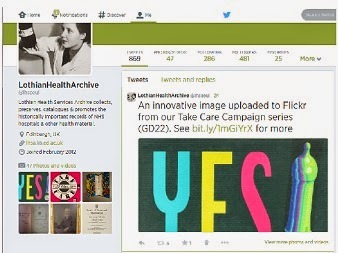 However, through regular tweets we can contact users in 140 characters or less about items of interest or exciting developments within the archive. We can also highlight changes to opening hours or search room closures due to events to ensure no one has a wasted journey to view our collections. Facebook allows us to give short project updates and talk about items of interest without alienating those with no time to read the blog. The great thing about social media is that no one misses out and we are able to promote the archive in ways that seemed imposible 20 years ago. Using social media allows us to make the collections fully accessible to anyone, anywhere at any time. The purpose of keeping archives is to tell their story to the world in an interesting way and social media allows for a flexible communication method that focuses on the collection, the staff and the users - the most important elements of any archive! As previous Dott project blog posts have discussed there is a wealth of information to be found in the individual patient case notes and they are made up of a variety of documentation from which specific details are recorded and entered into the catalogue. A lot of what we require for the catalogue entries can be found in typed case summaries or correspondence which will give details about the patient, their condition, how they were treated and the outcome of their treatment, but other documents such as clinical charts provide additional detail such as the type and dosage of medication the patient received and detailed monitoring of their physical condition. The volume of material comprising each case note can vary greatly, often depending on the patient’s condition and how they were treated. The clinical charts tend to be found at the very back of the case note and in some instances were surgical treatment has been undergone there can be a large volume of charts detailing the patient’s condition prior to and after their treatment. There are several different types of chart that appear in the case notes including those which record temperature, pulse, blood pressure, respiration, fluid balance, medication administered, body charts and eye charts. I have selected some of the different clinical charts I have come across in the last few weeks from case notes of patients who were treated in the Department of Surgical Neurology in 1950 and 1951. These records are a valuable part of the case notes as they can provide important detailed information that may not be included in case summaries about their symptoms and condition and showing how patients were treated and how they reacted to treatment. 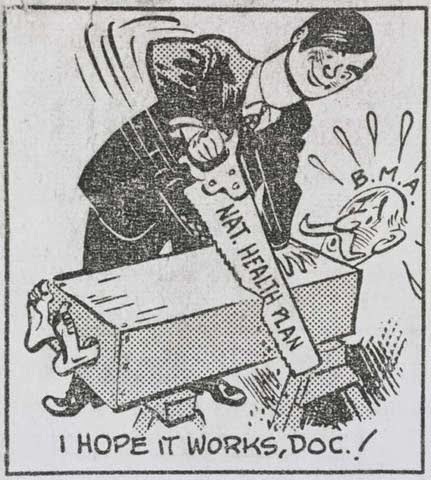 It’s the 66th birthday of the National Health Service on 5th July, and recently I’ve been finding out more about its beginnings and the healthcare that was available to ordinary people before 1948. The National Health Service was founded to provide universal healthcare to all, regardless of income or background, free at the point of use. 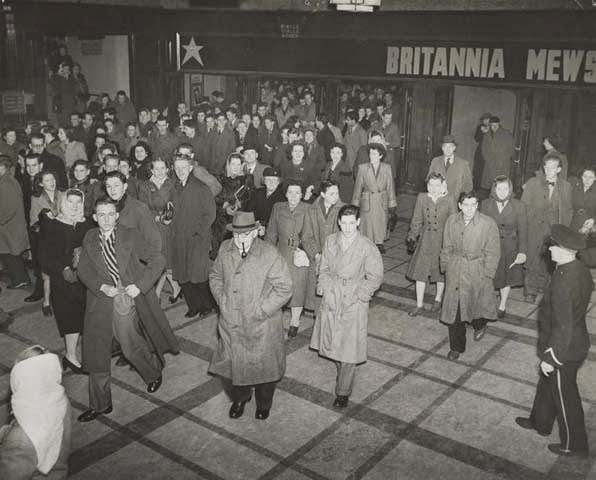 Before the arrival of the NHS, access to healthcare services largely depended upon wealth. In the case of poor patients, care could be paid for by the parish under the provisions of the 1845 Poor Law, whereas more wealthy patients would pay medical and board fees. Things changed a little in 1911 with the arrival of the National Insurance Act, an insurance scheme that paid for healthcare through contributions from employers, from government and a deduction from the salaries of male workers. However, the scheme only included those earning up to a certain amount and did not always include workers’ dependents. 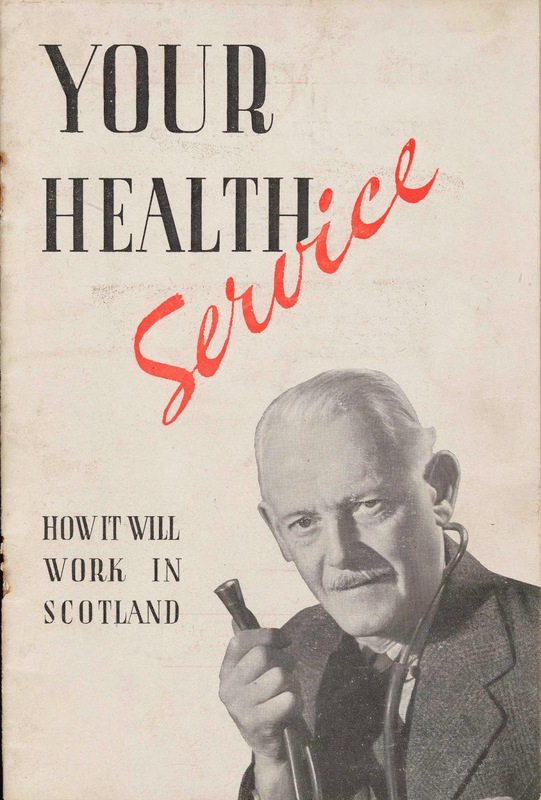 So Happy Birthday, NHS, from everyone at Lothian Health Services Archive – we’re looking forward to collecting the fascinating stories of your hospitals, nurses, doctors and (of course!) patients for many years to come!